For the real long-time listeners out there, you may remember the first time we spoke with Robert Brunner when he was a partner over at Pentagram, and we were on The Be A Design Cast. Totally overwhelmed just by sitting next to the guy on how good he seemed to be at what he did, and how all I could think about is how I need to be better at what I did. I left feeling like I learned more from him in 45 minutes that I had in the past year outside of it. Robert decided during this time to go out and start up his own shop at Ammunition, and we spoke with him about this shortly after (this time remotely, seems San Francisco is not a simple car ride over to his swank new digs). Last October I had the opportunity to see him speak, and chat briefly afterwards, at the AIGA conference in Phoenix, and a couple of things instantly came to mind: wow, this guy is still doing amazing work; ammunition makes super cool stuff; and how have we not had Robert Brunner on the Reflex Blue Show yet? 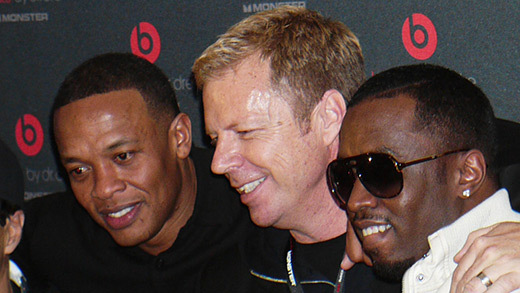 Also, did he really just drop a slide of him standing between Dr. Dre and and Diddy? Yes, he did. We spend this episode talking about the Beats by Dr. Dre headphones Ammunition is a partner (and product designer) for; launch events for a $6,000 toilet; his work in the ebook space with both the Kindle and the Nook; and how companies should use design. Also, even though the five years he was at Apple didn’t overlap either of the Steve Job eras, we still felt we needed to ask if he had a story about Steve, and he mentions one near the end of the show. Enjoy, and hope to see a number of our listeners in Boston for our next shows, where Ben and I will be dropping daily recaps from the 2012 HOW Live event. If you see us there, we may even have a few goodies in hand.